Ever had hips adjusted only for them to go out of alignment again? If so, then you likely have a structural leg length discrepancy (SLLD). While this may not seem like a big deal as SLLD is USUALLY negligible up to a point and doesn’t cause short-term problems by itself, it has a bottom-up effect on the body that can worsen over time, especially when coupled with other factors (e.g., stiffness, external trauma, stress from physical activities). 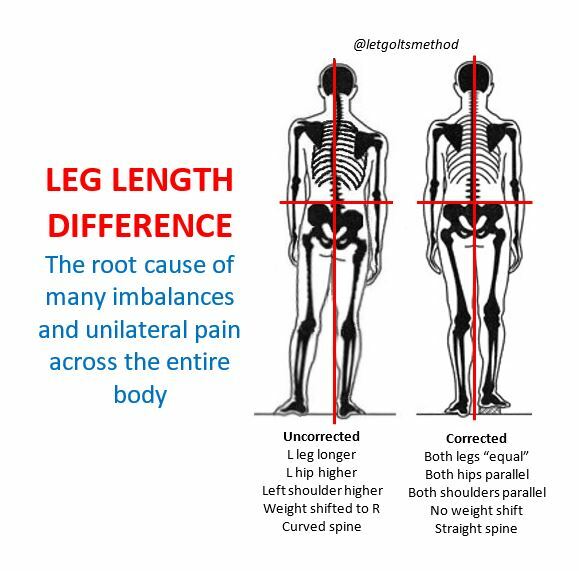 When someone’s problems are chronic and unilateral (one-sided), they can often be traced back to a leg length discrepancy. Due to the oblique angle of the pelvis, when one leg is longer than the other, it pushes the pelvis on that side up and back, which causes the opposite hip to “drop” and rotate forwards—in order to stand facing straight, the torso will rotate in the opposite direction. Since most SLLD’s involve a longer left leg, for explanation purposes, we’ll assume the left is always the longer side. When the left hip is higher than the right, the body tends to weight shift to the right—notice how the midline is much closer to the right leg in the image. In order to keep the center of gravity over the base of support, the lower back will curve to the left (this is a bit subtle in the image). The upper back will then side-bend to the right, raising the left shoulder higher than the right. Finally, in order to keep the eye-line horizontal and remain upright, the head will tilt back to the left. In general, this altered curvature of the spine causes the IT band, QL, obliques, scalenes, and levator scapulae to become tighter on the left than the right. On the right the hip flexors, piriformis, adductors, pectoralis and serratus anterior become tighter than the left, while the obliques, middle trap, and serratus posterior become weaker (reverse everything for someone with a longer right leg). Occasionally, this compensation pattern can also be altered by prior injuries or structural scoliosis. The only way to truly determine whether someone has SLLD is to measure the leg itself, from the greater trochanter of the femur to the fibular malleolus, and correlate it with the expected compensation pattern.